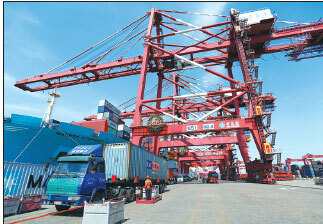 Qingdao, in eastern Shandong, has set its sights on further promoting innovation and development in its maritime industries, on the way to becoming a coastal city of international stature. Mayor Meng Fanli said that in addition to boosting its traditional shipbuilding, ocean transportation and coastal tourism industries, his city would also explore emerging fields such as marine biomedicines and sea water desalination. "We will develop a modern maritime industrial sector with the emphasis on high quality, in a bid to help our province and country grow into a strong maritime power," Meng told a forum earlier this month. The output value of Qingdao's maritime sector reached 290.9 billion yuan ($46 billion) in 2017, up 15.7 percent on 2016 and contributing 26.4 percent to local GDP, data from the city's statistical bureau showed. Helping the city's maritime sectors grow are a number of research and development entities. More are under construction or planned, which are expected to give a further boost to the future growth of the industries. One prime example is the construction of the National Deep Sea Center - the country's first public service base for deep sea research, surveys and equipment testing - completed recently. The center will offer support to the development of cutting-edge deepsea exploration equipment. Qingdao is a major development center and the home port for China's most advanced deepsea submersible, Jiaolong, which can dive 7,000 meters below the sea surface. It has completed over 150 trials and is ready for regular operations. The Qingdao Institute of Marine Geology is home to a key natural gas hydrate laboratory, which has played a crucial role in the exploitation of flammable ice in the South China Sea. In early March, official approval was given for the construction of China's first national marine equipment quality supervision and inspection center located in the city. Qingdao has 18 research institutes and eight universities that have marine engineering programs, providing students with strong technological training for the city's maritime industries. 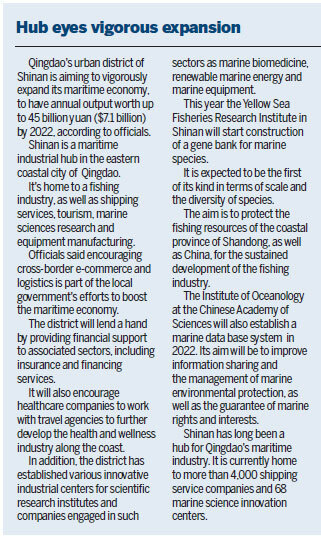 To further commercialize its scientific research, Qingdao has launched 110 projects in marine biomedicines to attract investment. Leading investors in these projects include Shenzhen-based BGI, one of China's top innovators in gene sequencing. The company established its northern China center in Qingdao, to collect and study the genes of oceanic species. An important hub city of the Belt and Road Initiative, Qingdao has also worked with international partners, including institutions and companies from Thailand, Malta and Indonesia, in innovative research into new vessels and engineering equipment. Qingdao occupies a coastal region of over 12,000 square kilometers, about 1,000 sq km more than its land surface. Its rich marine resources attract tourists from around the world. More than 88 million tourists visited Qingdao last year, whose spending topped 165 billion yuan. The number of overseas tourists increased 23.4 percent to 109,000 in the same period. Over the past 10 years, Qingdao has also been the city that hosted the most international sailing events in Asia, such as the 2008 Olympic Games sailing events, the Volvo Ocean Race and ISAF Sailing World Cup. Many local schools have established courses for students to learn basic knowledge of marine sports. About 120 schools have taught sailing, with more than 30,000 teenagers acquiring sailing skills. According to its mayor, the city will build itself up as an influential port city, applying information technology and big data to support its marine economy.